I read the new biography by Ashlee Vance on Elon Musk. Vance covers a lot of material about Elon, Tesla, SpaceX and Solar City. I liked but did not love the book. Vance emphasized the chronology of these companies and a somewhat superficial look into the character of Elon. This book only lightly covers his personal relationships (two wives, three divorces) and his business relationships at his companies. Walter Isaacon’s book on Steve Jobs was more satisfying. For this blog post, I am pulling out a few of the book’s interesting quotes which are in blue. Being a Silicon Valley native and successful entrepreneur, I related to many of the stories about all three of his companies trials and tribulations. Startups need people who have intense focus and drive. I have also found a correlation between a challenging upbringing and career success. The CEO often needs to be the center of attention and many key employees achieve little public recognition. At five and six, he had found a way to block out the world and dedicate all of his concentration to a single task. Lyons also saw an exhausted, stressed-out Musk spit coffee across a conference room table because it was cold and then, without a pause, demand that the employees work harder, do more, and mess up less. Like so many people privy to these performances, Lyons came away with no illusions about Musk’s personality but with the utmost respect for his vision and drive to execute. “He has the ability to work harder and endure more stress than anyone I’ve ever met,” Gracias said. “The mantra was that one great engineer will replace three medium ones,” Lloyd said. For employees like Gwynne Shotwell and J. B. Straubel, working with Musk means helping develop these sorts of wonderful technologies in relative obscurity. They’re the steady hands that will forever be expected to stay in the shadows. In the last few decades, a lot of smart people have focused on making money instead of building things. In earlier decades there were not as many opportunities to make large sums of money so rapidly, so smart people focused more on jobs that they enjoyed. Having lived in Silicon Valley my entire life, I have seen this subject come up every decade or so. Although machines are becoming more and more capable, they cannot think and are not conscious. A good example is that self driving cars cannot discern the difference between a piece of paper or a rock on the road. Although I think continuing to explore space, rockets, and planes is a good thing, I do not agree with Elon that focusing on moving to Mars is a particularly good use of human effort. First of all, the best approach to help humanity is not with technology but to focus on compassion and understanding other points of view. In the technology area, I think we should focus on maintaining our existing planet instead of trying to find a way to get to and live on Mars. A lot of my interest in Tesla is that I believe EVs can help prevent more climate change particularly when paired with solar. I recently had the great pleasure to take a P85D loaner while having my car serviced. Actually I was just getting the center consoled installed! While they installed the console, I drove the P85D for 125 miles. One trip over the mountains to the coast and back, and the second morning finding some errands to run around town. During the extended test drive, I found a number of small things about the D that I was not expecting. As has been reported many times, the acceleration is insane and very reminiscent of my four year Roadster experience. Super fun and smooth from a dead stop. In 2013, I had driven a P85+ loaner and was not overly impressed with it. I did not like the car’s reaction to full acceleration from a dead stop as the front lurched up and the wheels squealed a bit. The D was very fun; I kept it in insane mode for the day and never tried the sport mode. I definitely used a higher rate of kWh/mile than normal while enjoying this faster acceleration. Interestingly enough the motor noise was substantially different. At first I felt like a small jet was flying by. The volume was definitely louder than my S85. But after the first 30 minutes of driving I no longer noticed the noise difference. The P85D loaner seemed to handle exactly like my S85; both cars are equipped with air suspension. I couldn’t really tell a difference. I did take a good drive over and back to the coast on some really fun twisty mountain roads. During my Roadster driving days, I had horrible radio reception. I still listen to some AM and FM radio on a somewhat regular basis. The FM signal was not as crisp as in my car, but the AM station was completely inaudible. I suspect with two motors, the electromagnetic interference is worse. I easily showed this to the valet that picked up my car as we listened to an AM and an FM station side by side in the loaner and in my car and the difference was very noticeable. 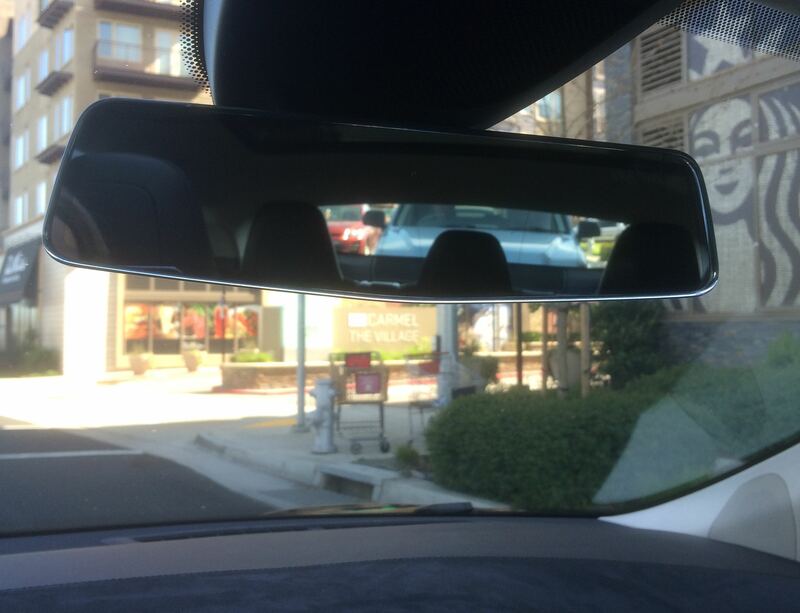 While driving, the car indicated several times that I was quite close to some mysterious objects in the road. 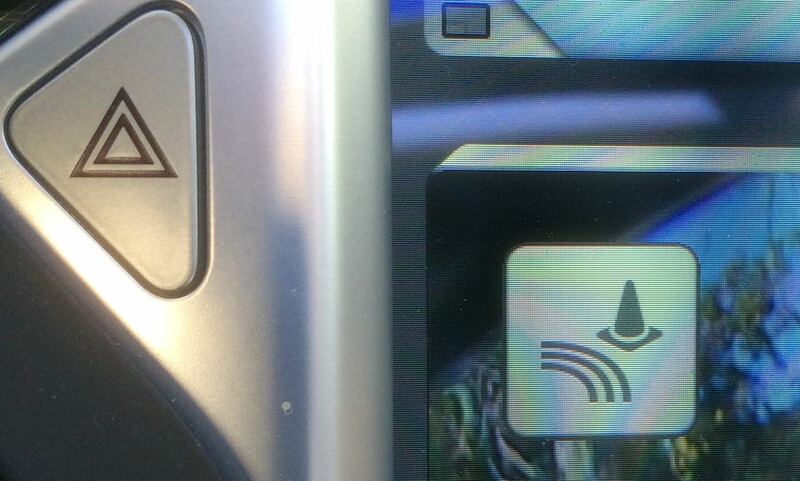 I have driven several loaners in the past with parking sensors and do not recall ever getting these warnings. The camera screen warned me more than once that I was close to a physical object. Also twice the dash flashed a warning in red graphics that I was about to hit a car or person in front of me. I like to drive away from all traffic and am by no means a tailgater. I did not have enough hours with the loaner to determine the true cause of these warnings. When I first got into the car, I noticed an astringent strong smell. This smell was so distracting, I rolled down the windows for a long period. I spent most of the 125 miles with the sunroof and windows down in one configuration or another. The weather varied between 60 and 75 degrees, so driving in this top down fashion was appropriate, but that smell took about 24 hours to not be noticeable. I don’t know if this car smell is because of some new surfaces in the manufacturing process, unusual behavior by another driver, or a chemical in the mysterious spray bottle I saw being used on the car before I picked it up. I can’t quite identify the nature of the smell other than unpleasant; my nose and sense of taste can’t determine the list of spices in restaurant food either. I know whoever that I am quite sensitive to the smell of cleaning agents. The newer rear headrests are so high, I almost wonder why there is even a rear window! At this point I largely depend upon the cameras, side windows and rear view mirrors. Only when changing lanes in dicey situations do I use the rear window, But with the new seat backs, the rear window almost useless. Why Even Have a Rear Window? I think Tesla now has a wonderful option for folks who feel the need for speed. I was not fond of the P85+ but the P85D characteristics are really nice. My area is in a big economic boom with more and more people and traffic. It is getting harder and hard to find places where I could really enjoy the insane acceleration. To trade in my 39,000 mile S85 to a P85D at this point would be a large outlay in dollars that I could not justify. However if I were buying my first Model S right now, the P85D would be in serious contention. The dual motors would work both for having a lot of fun and the occasional trips to the snow. I could potentially no longer keep the Toyota Highlander Hybrid that spends most of the time in the garage. Unfortunately with climate change, the California Sierra Nevada mountains have had so little snow in recent years, I almost don’t even need a 4WD vehicle anymore. Elon Musk had a press conference today to discuss upcoming firmware improvements in version 6.2 and beyond. New Range Assurance Application that is always running in the background. The car is always monitoring where it is in relationships to the superchargers and warns you if you may run out of electricity. This monitoring takes into account current weather conditions and terrain. You have to “opt-out” twice before running out of range. Built in trip planner that considers best route for your trip along with best charging opportunities. The trip planner also figures out how long you need to charge at the location and lets you know on your smartphone that it is time to go. The supercharger status is also on a network. The car is constantly communicating with this network. Model X is coming out this summer, and the first real auto-drive features will be available in six months. Over the next twelve months all of Europe and the US (except for Northern Alaska) will be covered with superchargers. In 2015, Tesla will be deploying more superchargers in the world than the sum of all superchargers to date. These new features are quite nice, and will be very helpful for those less technologically savvy. I have to admit I have never had any range anxiety while traveling. I am looking forward to having the whole continental US completely covered with superchargers. I hope that means I can take a trip through the lonely deserts of southern Nevada and Arizona without depending upon charging at a campground. For a true dream roadtrip, I would like a battery pack and a comfortable car that is still fun to drive that had a useful real world range of about 400 miles requiring just one charge per day. Recently a friend of mine was contemplating buying a Roadster. Of course, he wanted my advice during the process. In the area there were (and still are) two for sale of the same 1.5 vintage in the same color. He had arranged a test drive of one of the two Roadsters and wanted me to check it out for him. My friend is a true car nut and has owned 27 vehicles. He knows he likes to switch cars after only a few years. One nice thing about the Roadster is that very few were made. He is thinking there will not be much depreciation in the short term. The current prices are in the same ball park as the price I got for my Roadster 2 years ago. I probably sold mine at the worse possible time as there was a market glut as many Roadster owners switched to driving the Model S.
The Roadster we test drove had one slightly nasty scratch on it, but it handled flawlessly. I really enjoyed my short spin around the block as I had not driven a Roadster in a couple of years. I like driving a smaller car as it is simply easier to fit in the congested roadways. I also just enjoyed the overall zippiness but I did find the steering just a wee bit loose. Before we finished checking out this Roadster, the car reported that it needed service. The owner had a very recent service report from Tesla. In my area there always seems to be a handful of Roadsters for sale at any given time. My friend and I found the two Roadsters for sale through two different 3rd party dealers with prices within $5,000. The two third party dealers use different business models. One dealer does negotiate and takes trade ins but also has a stellar reputation for being in the used car business. The other dealer does not negotiate. If the car does not sell within a period of time, the price drops. As with any car, the buyer needs to discover the service record, the current condition of the car and also any existing warranty. But with the Roadster or any electric vehicle, the buyer needs to pay attention to the state of the battery. One of these Roadsters had about 15,000 miles and the other about 60,000 miles but surprisingly the battery values were quite similar. Neither dealer posted the charging value clearly on their website. At a minimum I would have them charge the car up in standard mode and report the rated miles listed before purchasing. The easiest way to check if your battery is in range of normal is to compare it to the data at plugin america. In the end my friend did not buy a Roadster. He realizes that his partner would be much happier in a Model S. He ran the numbers on a 60 and decided he didn’t need another vehicle that would run him about $1,000 a month. I’m also not all that surprised that the two Roadsters are still available. Winter is a slow time for convertible sales despite it being 70 degrees here this week, which is very warm for January. Tesla announced a new 3.0 upgrade package for the Roadster. In their prototype testing they have found an increase in range of 40-50% over the original Roadster. Early in 2015, they will be demonstrating this by driving a Roadster from San Francisco to Los Angeles, a distance of 400 miles, without charging. The range improvements were achieved with three improved technologies: a new battery cell with 31% more energy than the 2008 battery cells, a 15% improvement in aerodynamics with a retrofit aero kit, and 20% improvement in rolling resistance using a new type of tire. They are also making changes in the wheel bearings and residual brake drag. I am not surprised that Tesla achieved this improvement in range. I was more surprised when I initially looked at the Model S and found how efficient it was in comparison to the Roadster. Now the approximately 1,500 Roadster owners can increase their range. Having owned a Roadster for several years, I did not find it a car I would want to drive long distances on a regular basis. Although extremely fun to drive, the Roadster is not a particularly comfortable or luxurious car. The are two more important parts of this news. One is that Tesla continues to support their cars. The second is the demonstrated improvements in battery technology that will likely benefit the Model S down the line along with all future Tesla vehicles. I would always buy the battery with the longest range for road trips and longer shelf life. I found something else that will not fit into the trunk. An old backpack with a frame. I don’t think they even sell these kind anymore, but I am not a frequent backpacker. 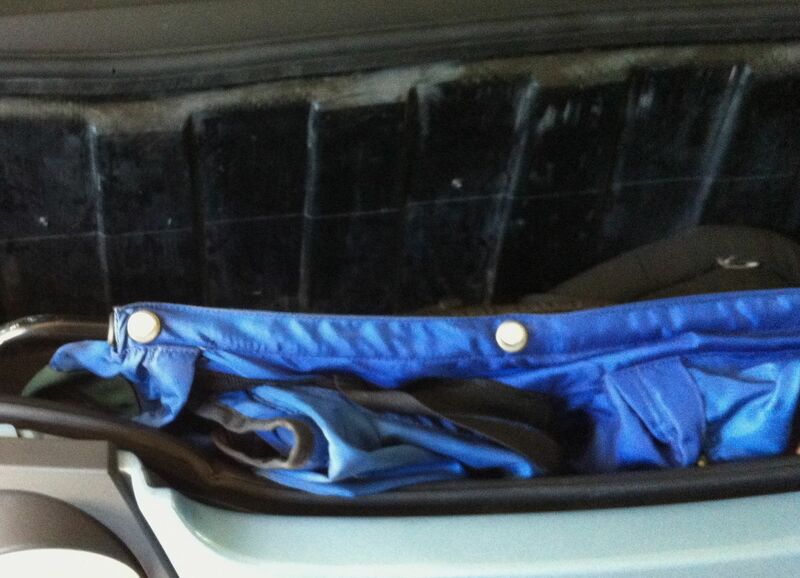 I wanted to go on nearby trails with some free weights to prepare for an upcoming trip, but the trunk is simply too small for the frame.